As we begin another year, I always like to take stock of what we learned in 2017. In fact, we often do reviews of our client websites to let them know what we think is working great for them and what could use a little help. 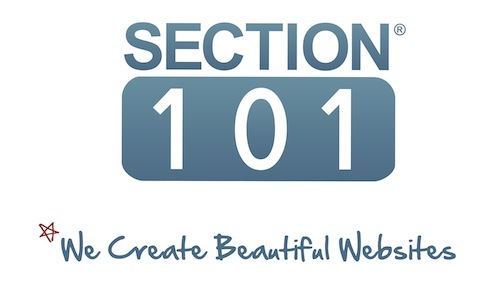 Section 101websites are a great solution for people who don’t want a “cookie cutter” website, but do want help with the layout, design and look, while retaining control of the site post-launch. No other company fills this need the way Section 101 does, and we’re proud! One of the most effective and important website trends we’ve identified in the past year is the goal of displaying your brand effectively. It may sound simple, but you’d be surprised by how many websites miss the mark on this. As little as three years ago, websites typically had two or three columns on the homepage with a lot of information on it. With the exception of retail, and some online magazines, more and more savvy websites are now using their homepage to present their brand visually. Whereas content-heavy sites were once the norm, visuals are now used to express information about a company. The visual can be a photo, like when Ani DiFranco’s website used stark images to launch her new album, it can be a video, as BUSH has done for their new single “Lost in You,” or it can be a logo with tagline, which Law Media Group/LMG (“winning the narrative in a changing world”) has used to terrific effect. The new website Section 101 launched for the Reum Brothers, whose highly anticipated new book SHORTCUT YOUR STARTUP will be out in mid January, features pull quotes from Ariana Huffington, Steve Case and Tony Robbins among other notables. In the sixty-seconds you have to make a impression, the Reum Brothers have done it with a book jacket, summary and high profile buzz front and center. It wasn’t long ago that people dismissed having a website in favor of social media, but in today’s climate, companies, brands, bands, authors and more all know that ‘just good enough’ is not enough. A website can certainly help you to secure business, or gain fans, but it typically doesn’t result in any kind of loss for a product – it’s always a win-win. A website is the ultimate marketing tool that YOU control. You need to make what you’re doing/promoting/talking about exciting enough for people to want to find out more.